Friends tell me they would love to go back to the days when their children were young. There are times we treasure – playing happily with a child or a beloved pet, reflecting quietly in a favorite armchair, celebrating a hard-won victory – because they represent the essence of who we are. A portrait stops time and forever preserves those moments we wish to carry with us. A good portrait is a defining statement. I welcome portrait commissions of people, dogs and other subjects in oil or watercolor, pen & ink. Please contact me by email at ChrisDuke@ChrisDukeArt.com to discuss a potential project. We will discuss exactly what you are looking for in your piece of art, including size, subject(s), setting, and additional elements or objects. I will photograph the subject(s), setting, and meaningful objects you would like included. Alternatively, I can use your photographs, or discuss with you how to take suitable photographs for me to use. I will send you a sketch for your approval. After sketch approval, I will complete the artwork and send you an electronic copy. I will send you the finished art via FedEx or a similar carrier. I am happy to deliver the art professionally framed as I consider the frame to be an extension of the art. We can discuss mats and/or linen inserts, frame options, and the pricing for each. 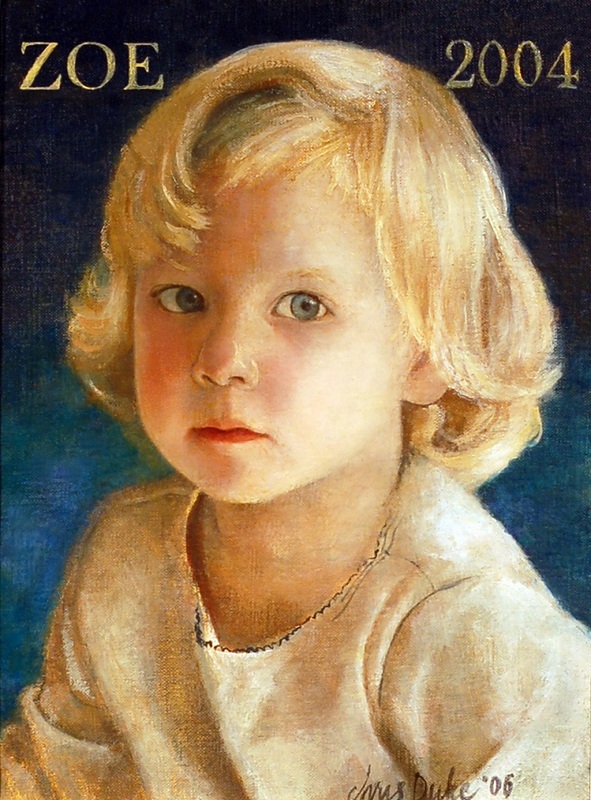 Zoe was a mysterious two-year-old with a captivating gaze. Price varies according to the artwork size, number of subjects, intricacy of the subject(s) portrayed, and complexity of the setting. The price includes all rights to use and reproduce the artwork. Some starting prices are listed below. Watercolor, pen & ink 16" x 20" drawings start at $2500. Oil Small (10" x 12") paintings start at $2500. Medium (24" x 36") paintings, such as a 3/4 view of one subject, start at $7500. 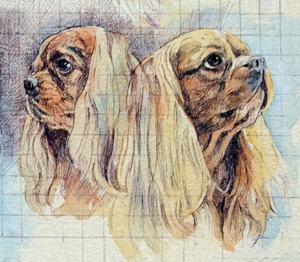 Watercolor, pen & ink Small (4" x 4") drawings of a pet’s head start at $500. Large complex drawings with multiple vignettes start at $4000. Oil Small (10" x 12") paintings start at $1800. Duration varies depending on my availability. Please allow at least 4-6 weeks for watercolor, pen & ink order completion. For oil paintings, please allow at least 3-4 months. Because I use classical oil painting techniques, each painting contains multiple layers of paint and glaze that must be allowed to "set up" after being applied. Rosie was cute at too many angles to choose one definitive pose.